One of my most-loved childhood memories at Christmastime was venturing out to Merville to choose and chop the perfect tree for our family’s living room. 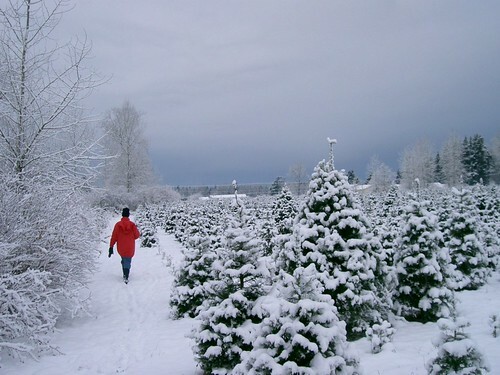 Though it may be tempting to visit your local grocery store or home building centre to pick up a pre-cut tree, not much can replace the magic of a visit to a Christmas tree farm. The British Columbia Christmas Tree Council has a comprehensive website that includes a handy farm search tool. Their site even includes a list of the Top 10 Vancouver Island Christmas tree farms from Campbell River to Saanichton. Read on if you’re not convinced. As beautiful as they are, real Christmas trees require constant maintenance in order to maintain safety in the home. Water your tree daily, use only no-heat LED lights, keep it away from vents or other heat source and make sure your tree lights are turned off when you’re not home. Click here for more safety trips. ← Get Your Skis And Boards Waxed: Opening Day Is On Its Way! Thanks for this post, Keira – there are a number of pros and cons and people need to be informed! Wow…this sounds incredible…definitely missed out on this growing up in SoCal. Have you already chopped this year’s tree?